World Aids Day Is December 1st, 2014. Three Decades and No Cure in sight! The only explanation I can come up with is racism. My conservative friends will chide me for “playing the race card” but clearly there’s no other reasonable explanation. Why else would so many white people wish his failure before he even steps foot in the Oval Office? The amount of disrespect thrown at this president is unprecedented. Even G.W.Bush, arguably the most disliked president since Nixon, didn’t receive this level of hate and betrayal. I hated Georgie Boy to the core for deceiving the country into invading Iraq. But I never would have thought to publicly disrespect him. I was always taught to respect the office. I didn’t have to like the president, but as an American I must respect the office. Where’s that patriotic sentiment now? In honor of #NationalComingOutDay, I’m reposting this gem from last year. As with most of my posts, this one is a little rough around the edges. But it does give you an idea of where my head was at that point of my life. 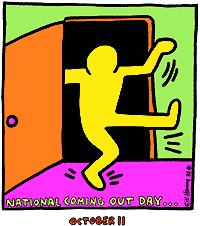 BTW, for anyone struggling with the decision to come out. It does get better. I am so much happier than I was then. Cheers! Built in 1924 for the silent Phantom of the Opera, starring Lon Chaney, the vast soundstage still houses the 90-year-old opera house set. Designed by Ben Carré, this recreation of the Paris original practically deserves its own star on the Hollywood Walk of Fame, having appeared in movies ranging from Dracula to The Muppets. iPhone does it too. It’s part of theft prevention and phone recovery. (Find My Phone, Device Manager, etc.) You can opt out of these services. For Android, turn off “Location” in settings. You can delete your location history at any time by going to the Google website provided. Also, Location services are needed for GPS. If you use your phone for navigation, your phone will track your location. EVERY GPS device, TomTom, Garmin, Magellan, etc., tracks and records your location. That’s why they tell you to enter a nearby intersection or landmark instead of your real address as “home”. It’s up to consumers to decide how much of this information that are comfortable with sharing. On the 45th anniversary of the Stonewall riots—an event that transformed a minuscule pre-Stonewall gay rights movement into a mass movement—LGBT history is still being left out of the public school curriculum. California is the sole exception to this rule, having passed the Fair, Accurate, Inclusive, and Respectful Education Act in 2011. It mandated the inclusion of the political, economic and social contributions of LGBT persons in textbooks and the social studies curricula in California public schools. While the control of curriculum and the choice of textbooks rests with local school boards, it’s time for state legislatures to take up the issue so that such curricula are adopted nationwide.